We have had several requests to republish "Marmots" our guide to Swiss Route 3. It has been out of print for some years. The route is covered in slightly less detail in "Cycling in Switzerland" From Cicerone, along with all the other Swiss National Cycle Routes. 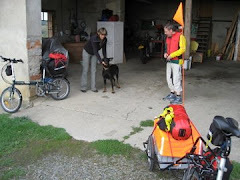 Finally we gave in to the requests and we updated the accommodation, bike shop, bike hire and transport sections; checked the route cartographically and modified the page layout of the book to produce an e-book. It is available for US$ 8.99 from Smashwords. We will also produce a version for Amazon, one of these days. Kindle users too should remember that one can download a Kindle compatible formated file from Smashwords.